Per settlement, Dragon Box will pay $14.5M and close piracy-enabling services. The entertainment industry has scored a big victory over the maker of a “free TV” box that helped users watch pirated video. 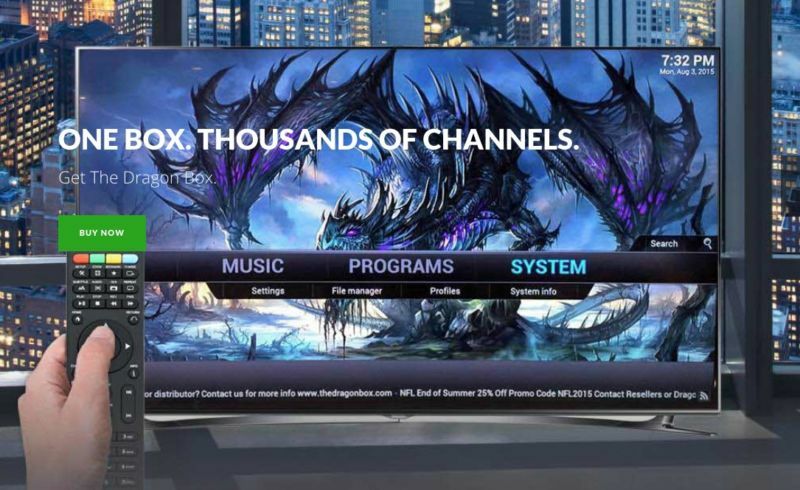 Dragon Media Inc., whose “Dragon Box” device connects to TVs and lets users watch video without a cable TV or streaming service subscription, has agreed to shut down the Dragon Box services and pay $14.5 million in damages to plaintiffs from the entertainment industry. Dragon Media was sued in January 2018 by Netflix, Amazon, Columbia Pictures, Disney, Paramount Pictures, Twentieth Century Fox, Universal, and Warner Bros. Dragon Media’s lawyer initially predicted that the lawsuit would backfire on the entertainment industry, but the Dragon Box maker must have decided it had little chance of winning at trial. The plaintiffs and defendant filed a proposed settlement Monday at US District Court for the Central District of California. The settlement requires Dragon Media to “cease all operation of the Dragon Box system” and related services within five days. Under the settlement, “[j]udgment shall be entered against Defendants and in favor of Plaintiffs on Plaintiffs’ claims of copyright infringement, and damages shall be awarded to Plaintiffs in the amount of US $14,500,000,” the document says. Dragon Media, Dragon Media owner Paul Christoforo, and reseller Jeff Williams “[s]hall be further enjoined from operating any website, system, software, or service that is substantially similar to the Dragon Box service,” the settlement says. The settlement also prohibits the defendants from making its source code or other technology available to others. The plaintiffs in the case are part of the Alliance for Creativity and Entertainment (ACE), which has been trying to stamp out piracy of its members’ content. In September 2018, ACE members scored another favorable settlement over the maker of a similar streaming device called the TickBox, winning a permanent injunction and $25 million in damages. When a customer selects “DRAGON MEDIA” for the first time, the device prompts the customer to download the “DragonBox” software. After clicking through the guided “Media Setup,” the device downloads and installs the latest version of Dragon Media.